Aged Care: Some Are Not Happy! The emphases throughout is on the ‘commercial’ aspect. Not a word ensures that the sale will be allowed only to another aged care provider. Council is giving itself plenty of leeway it seems with the repetition of ‘all or some’ of the designated land. Given that Weeroona is a massive site of approximately 1.6 hectares, developers would perhaps be eyeing off such a sized property – and not necessarily for aged care but for residential development. How many apartments could be fitted onto 1.6 hectares we wonder? Finally please note the outcome of this vote. Clearly, not every councillor was ‘happy’ with the motion. Whether this ‘unhappiness’ related to the publishing of the resolution, or against the proposed sale itself is anyone’s guess. How many councilors voted ‘nay’ so that the motion was only ‘carried’ and not endorsed unanimously. On such an important decision surely one councillor at least had the guts to call for a division so that residents would know which councilors favoured sale and those opposed! No such luck in this happy group of campers. On the evening of February 7th, Cr. Hymes implied on Facebook Glen Eira Residents Action Group that council’s residential care homes may very well be sold to a reputable not-for-profit organisation, who would be in a perfect position to provide specialised care. Since then, that comment of his has been removed too. Hogwash, nothing else. We believe that those comments are still online and available. I stand corrected, thank you. Late yesterday I could not locate them. My apologies. This is just asset stripping of would could and should become public open space one day the Centre Road property would be a get open space link, something GE is very short of. It just another golden opportunity by our councillors, wasted through their inability to think about the future. T junction is already a traffic jam at peak hours. Medical centre staff and patients regularly ignore Clearwater signs, thus leaving only one lane for passing traffic, which is blocked by cars turning right into Mackie Road. Most mornings traffic is backed up to as far as Victor Road. Not to mention opposite direction. Traffic at standstill between Mackie and Warrigal Roads. With the new cafe just opening, things won’t get any better. Closed door decision, no explanation and another wishy washy resolution that allows for plenty of wiggle space for these clowns to do as they wish and not what’s in the best interest of the people they supposedly represent. Another article yesterday in the news paper about the appalling aged care situation in our country but don’t worry our genius mayor is an expert in this space. Update of families of Warrawee meeting. 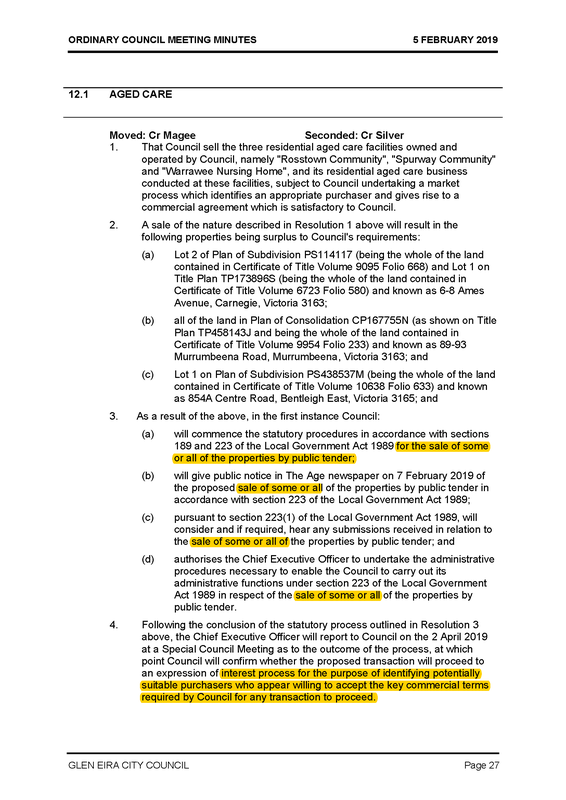 One community member asked that it be written into the sale of contract that there be a requirement that the 3 facilities stay as aged care facilities for a stated number of years. After a bit of fumbling by Mayor and other Glen Eira staff it was something they said could be considered. A very important requirement I would say. Money will not be spent on day to day council expenses. Again we are taking away from isolated and vulnerable to spend on what? Overall the meeting highlighted the disappointment that community members feel towards our council. At staff meetings, carers expressed their concerns regarding residents feeling upset by the news , some in tears. Peter Jones (director of community services) assured staff he will be engaging a physiologist to talk to upset residents. To a question at the Warawee meeting, what if an appropriate buyer cannot be found by March 12, CEO answered that Council already have buyers lined up. Appropriate or not, she didn’t say. Buyers lined up? How long since they voted to sell? Yes our mayor is going to use this money to support the isolated and vulnerable according to him. Hmmmmm so lets take it away from the mist isolated and vulnerable group in our community , the aged. This is clearly a financial decision, these facilities have been heavily subsidised by council for many years. What efforts have Council made to reduce operating costs and maximise revenue? Are child care centres next? What about GESAC, how much subsidy is required to keep it open? Seems like Council is neglecting our aged citizens. Surely these services could continue to be subsidised from the huge growth in rate income arising from the huge increase in rateable properties arising from over development! Half of their loss represents unnecessary middle management salaries, just like in Community Services. Extra levels of management roles are being created. In-home-support services, meals-on-wheels, social support groups for over 65’s are next on the agenda. In fact, as early as July 2020. Warrawee just purchased 2 rickshaws from Denmark for outings for the residents, ridden by volunteers. So far, only been used for display purposes. What ever for? Never mind, at least we’ll be able to wheel out our elderly citizens to get some fresh air under the new rotunda, in Bentleigh. Glen Eira has provided high quality, resident focused care, respecting individual resident care needs, choices and differences, unfortunately the attention to quality care comes at a cost that exceeds the funding provided through Commonwealth Care Subsidies and Resident Contributions. Glen Eira should be proud of the Services provided instead of just walking away from our vulnerable aged residents. Not for Profit Providers will not continue to operate services that require $3m in annual subsidies. Sale of 3 residential care sites have the potential of bringing in $50 mills. If council is genuinely concerned of providing housing for socially and financially disadvantaged people of Glen Eira, why not utilise these buildings/assets for affordable housing? They all consist of independent bedrooms, en-suites, all with courtyards/garden outlook, many of them with kitchenettes, all located in prime locations close to all amenities. Why sell them off and spend money on pocket-parks at $2 mills each, which nobody uses?